The English gentlemen’s dog! In 1500s England, most gentlemen had packs of “hounds” for hunting. Bigger hounds tracked deer and foxes, while smaller ones went after rabbits. The smaller ones were the first Beagles, who were actually brought to England by conquering Roman armies (like Rottweilers). Over the centuries, foxhunting became more popular and Beagles were gradually replaced by Foxhounds. Fortunately, the Beagle breed was continued by farmers in England, Ireland, and Wales who continued to keep packs for rabbit hunting. 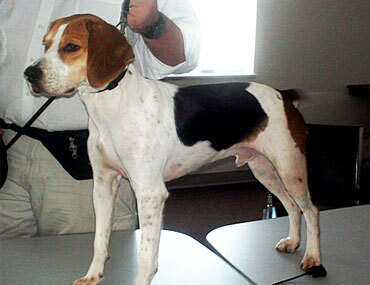 In the mid-1800s, a pack was established in Essex, England which is considered the descendant of the modern Beagle. Today, the Beagle is the third most popular breed of dog in America. Who can resist a fuzzy little Beagle puppy? Beagles are good-natured, curious, and affectionate dogs that love the company of people. They are great for families and do really well around kids. Another great feature of Beagles: they’re low-maintenance. Their coats are short and don’t require a lot of grooming, and because they’re small, they’re a lot easier to care for than larger dogs with bigger appetites who need more room. Beagles love to be outdoors, rolling around in the mud and bushes! Because of their hound instincts, they always tend to have their noses to the ground on the trail of new and interesting scents. All in all, they are superior tracking dogs and are very agile. Beagles can be great dogs for the right person or family, but there are always things to consider when thinking about welcoming a new dog into your home. They’re vocal. All dogs bark, but Beagles often take barking to the next level with a well-known howl. This isn’t for everyone. If you want a calm, quiet dog or if you live in an apartment, the Beagle might be a little too disruptive for your tastes. Beagles are pretty smart dogs, but they are a little bit more difficult to house train. In fact, they’re not the most easily trainable dogs in general. Expect to have more issues with “accidents” during your first few months with a Beagle, but also expect to put more effort into other types of training as well. . If you are prone to allergies, a shedding Beagle can drive you mad. Beagles are moderate shedders, but their hairs are short and straight and get everywhere. Beagles love the outdoors. This is great for people who love the outdoors but not for people who are worried about their home being completely clean. They also need a lot of exercise, making them a bad choice for someone who is sedentary.